We Should All Be Feminists is an essay by award-winning author Chimamanda Ngozi Adichie, based on her TEDx talk on feminism. It’s very short, and can easily be read in about 30 minutes. And I would highly recommend everybody to read it, men and women alike. Because gender equality and feminism is such an important topic that unfortunately still has so many misconceptions. I mean, how often do you hear someone make a (intended or not) misogynist remark that has you stopping for a minute, thinking “This does not sound right.” But nobody replies or even realises it because a lot of (misconstrued) ideas on gender have become so internalized. Certain things have become normal. And we need to realise this so we can do better. That is what Chimamanda explains beautifully in this essay. She explains all these big concepts in a very easy, understandable but eye-opening way. She managed to efficiently summarize ideas floating in my head that I never really was able to put into words. Like said in the essay, a lot of people think “Why feminist? Why not just say you are a believer in human rights?” That’s the same misjustice as when you would say that all lives matter, not just black lives. Or saying sexual pride instead of gay pride. It is a way of denying that there is a problem. A way of denying a certain group of people who have been faced with injustice. So why don’t I give you a few quotes from the essay to give you a sense of what it is about? And really, I could basically quote the entire essay because it is just that quotable. Then please read it. Or even watch her TEDx talk if you don’t feel like reading. Because being called a feminist should not be an insult. And if we want things to change, it starts with us. We need to understand these concepts, get rid of our internalized ideas on gender and then share them with people around us so we can learn to do better. 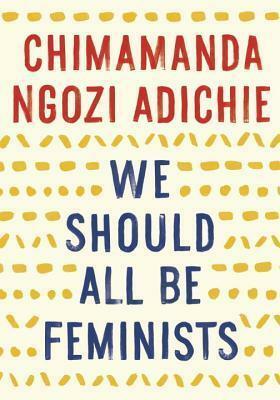 Have you read We Should All Be Feminists? What did you think about it? Glad you enjoyed this, Lindsey! It’s such an important book and I feel like it should be required reading because there’s so many misconceptions about what feminism is and this is such a great introductory guide to it. Yes, it really is such an important read! She explains it all so simply, but still so thought-provoking. It should definitely be required reading in all schools. I haven’t read it yet, but from what you’ve said, I wish I had. So many should people should. Oh, I’d definitely recommend this to everybody 🙂 It’s such a short but important read!